The German Network and Coordination Office Against Trafficking In Human Beings is a registered non-profit organisation. We engage on a regional, national and international level, fighting trafficking of women and promoting migrant’ rights. Established by social workers in 1987 to support victims of trafficking, the NGO became an official organisation in 1999. It now supports 38 member organisations, including counseling centers for victims of trafficking, migrant focused projects, women's shelters, counseling services for prostitutes and single women. The overarching goal of the organisations is to advocate effective and progressive measures to combat human rights violations against women. As the only German organisation with this focus, our intention is to act as a national and international interface between counseling services, public and private policy as well as key organisations. KOK e.V. sees trafficking in women in terms of the migration process, which is triggered by the prevalence of worldwide poverty, global crises and conflicts, and rapid transitions in political and economic spheres. In order to support their families, women are becoming increasingly forced to leave their home countries in search of employment. Some of them become victims of structural, psychical and/or physical violence during the migration process. One form of this violence against women is human trafficking. 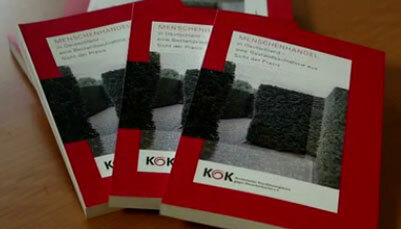 The interdependence of KOK e.V. allows the continuous exchange of practical experiences and coordinated arrangements against human trafficking. KOK e.V. represents the common social and political interests of its members, with its goal to develop and strengthen networks on a national level. We achieve this through mutual exchange of information and experience, collaborative action and corresponding development programs. 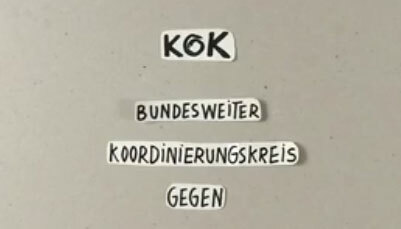 KOK e.V. lobbies on a national and international level to positively influence legislation and decision making processes.